I am a fan of fresh mushrooms :p and most of my meals consists of kimchi and stir fry mushrooms :) WB always complain that I live on mushrooms alone LOL! 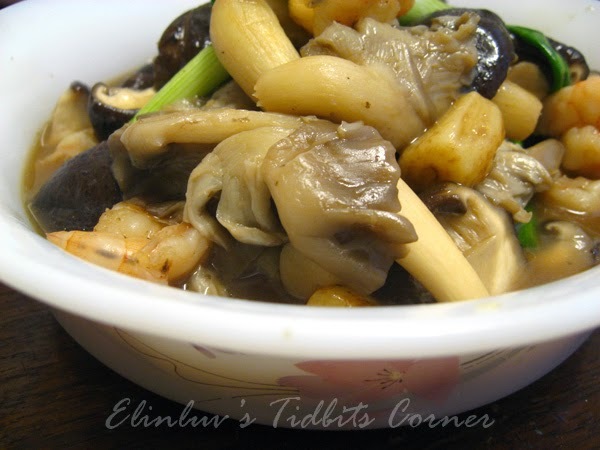 but I always cook a meat dish for him or our Piggies will think I bully their Daddy Boar :) Today I am sharing another mushroom dish . This dish is flavorful because I added deep fried whole garlic the dish. It gives a stronger garlicky taste in the gravy and the deep fried garlic melts in the mouth...mmmm I can tuck in all the fried garlic and WB surprisingly loves the fried garlic too. Heat wok , add in a slice of ginger and saute till fragrant. Add in the seasoned sea prawns and stir fry till it turns pink and cooked. 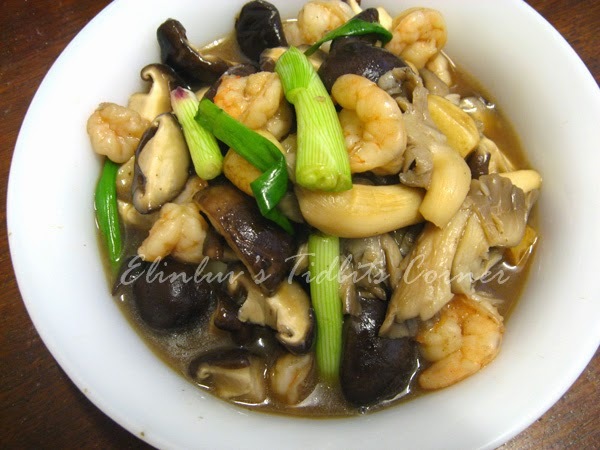 Add in the fresh mushrooms and continue to stir fry till soft and cooked. Add in the deep fried garlic and thickening sauce and spring onions. Once the gravy thickens, dish up and serve hot.